I got a bee in my bonnet if you will. The bee goes by the name of Pottery Barn. And once a bee gets in there I don't stop until whatever is making it buzz is done. It's in my very nature. 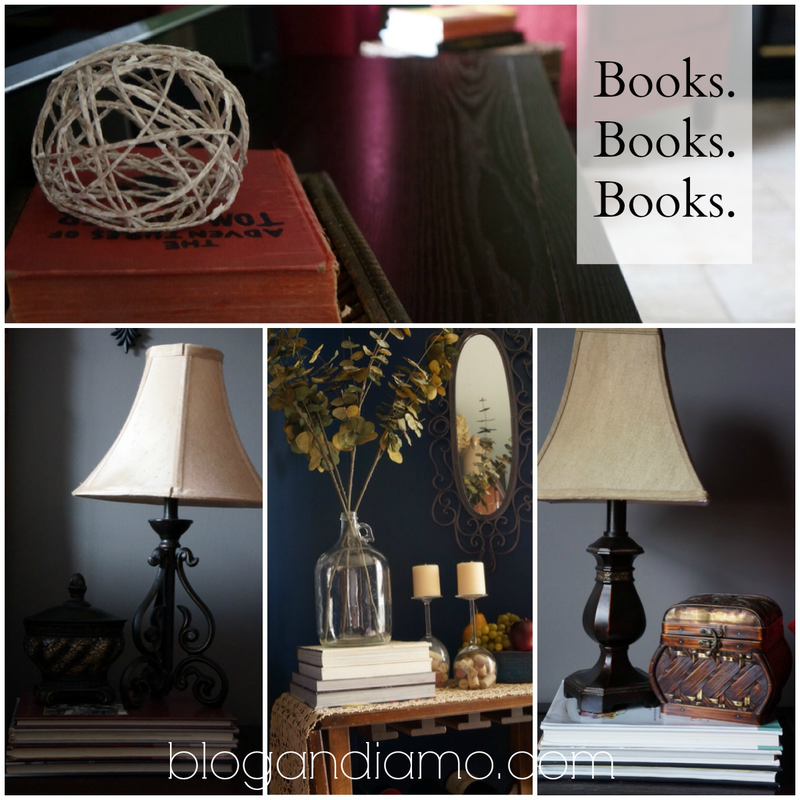 Call it a reaction to the decluttering that happened before the move or call it nesting. I don't care. Obsessed I am. 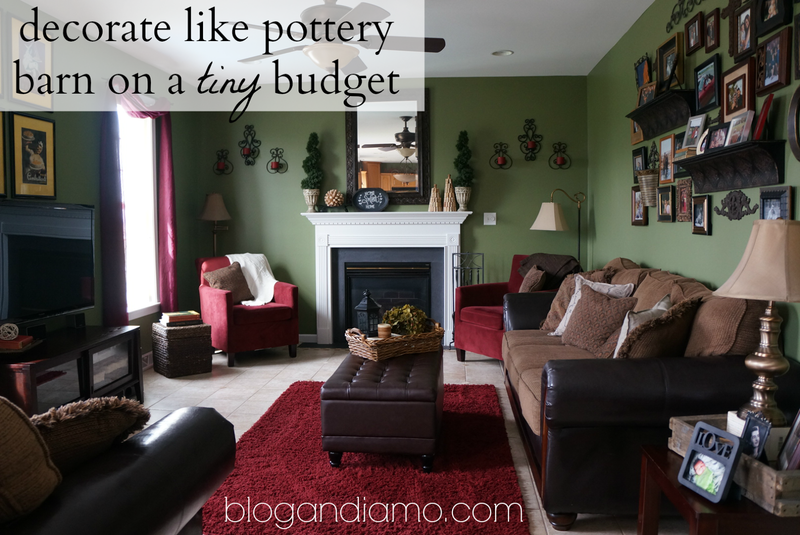 The only problem though is that I have a Pottery Barn taste but I am on a "Walmart" (or lower) budget. Meaning free or cheap this bee must be. I narrowed my focus down to three rooms. My family room. My dining room (although not much happened here because it's not possible for me to have a fully set table all the time). And the master bedroom. At first I started research. I scanned gads of images on google. I looked through the catalog again and again. And then again. I scoured Pinterest for suggestions. How does one start? I found (in my opinion) through my extensive research that a lot of PB "rooms" had the following "look". Lots of those layers. Fabric upon fabric. 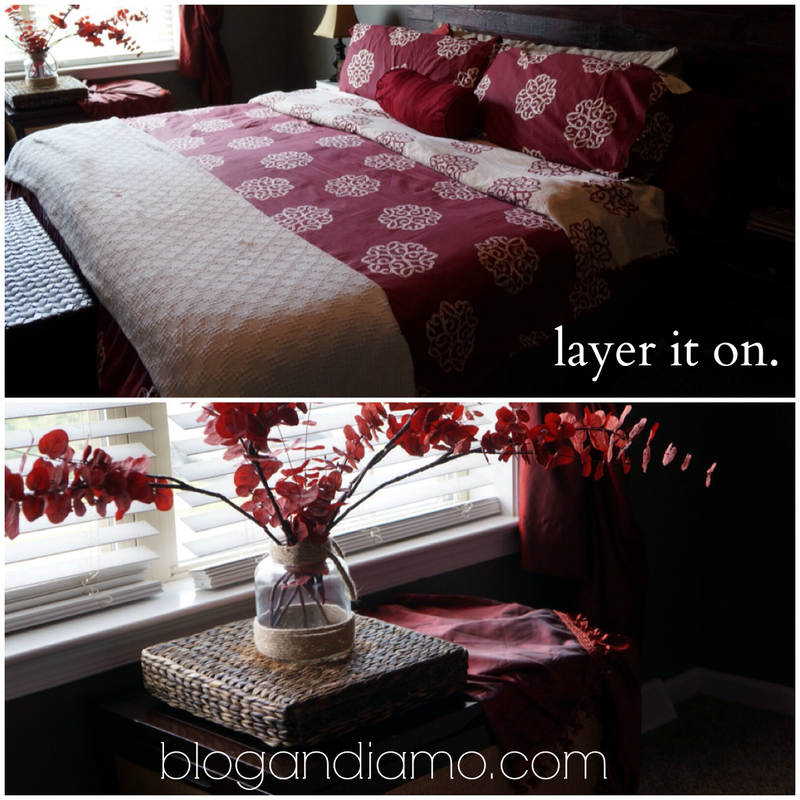 Fold down your comforter and add a blanket at the foot of your bed to add a richer look. 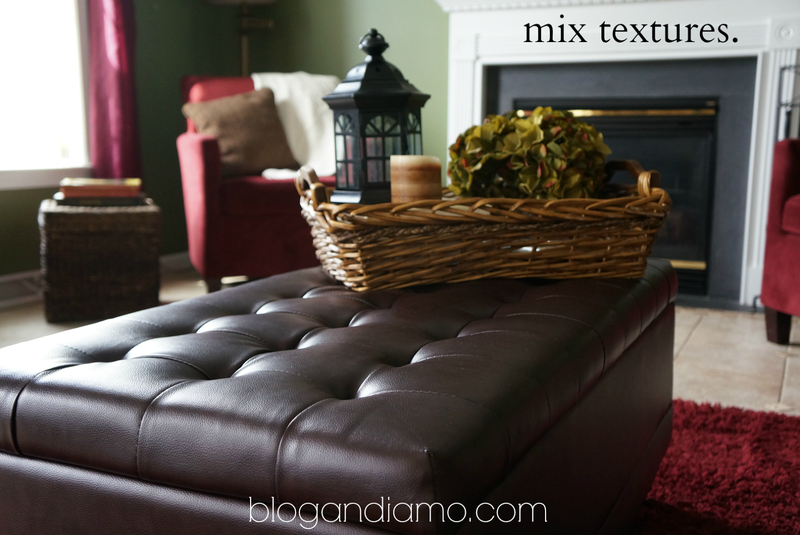 Add throw blankets of different styles and colors and textures onto chairs and couches. Add more throw pillows. And then add more. Place an arrangement on top of a large book or basket or box. A frame on a table all by itself? Never! Things look and feel different in their rooms. Or I can imagine they would should I ever enter one. Mix leather and baskets with glass and a book. Add linen pillows with a cable knit blanket. If it doesn't "match" that seems to be best. Throw them everywhere. That's all I have to say about that. Candles are generally expensive so I really didn't go here yet. I had a few in a box I brought out. This is something that I'll slowly add to if I stumble upon a good sale. Everywhere! I lived under the mistaken assumption that baskets equalled country. I guess I was wrong. And my mother is finally in her glory that I'm adding baskets everywhere. Under end tables. In corners. On top of tables. Stacked. I filled them with blankets or scarves or you guessed it, books! This doubles as storage too but the idea is to look pretty and to stick with storing things that match the room. This is basically all I did. I had a collection of a few old candles and tons of old books and unused blankets. 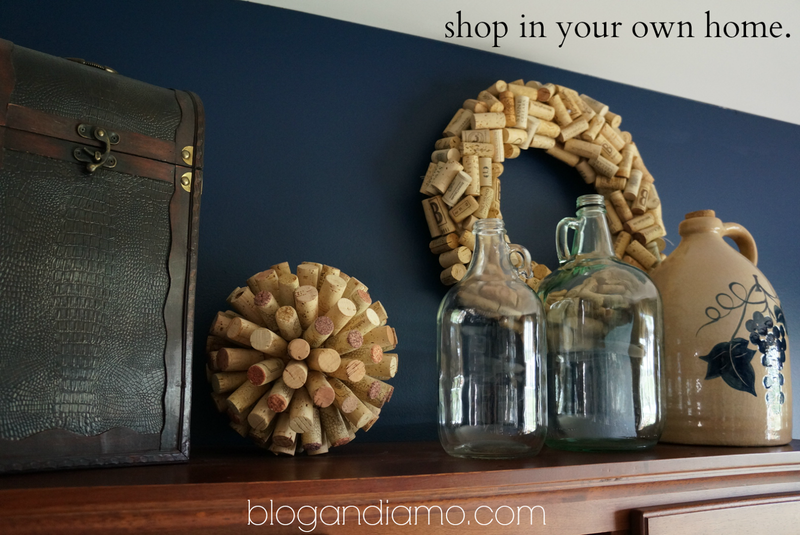 I also shopped in my mom's home and took all her old baskets and soooo much more. I looked through all the things I had put in storage when I decluttered to prep for the sale of our old house. I stole Matt's glass jugs that he uses for wine making (as seen above). I carried things around the house for days to figure it all out, placing an item in a location for a bit and then trying a new place for a bit, etc. So what did I actually buy? Two throw pillows. 1 and 2. Two throw blankets. 1 and 2. One old pocket knife factory drawer from a local decor warehouse for $7.99. My total for the three above rooms? $73.96. You do a great job making it not look junky.. like its a lot of stuff but its really all placed perfectly. Now seriously.. how do you get the kids to not destroy it?! Lovely! And all for under $74?! You got skills, girl! You are amazing! Everything looks so great! I love it! Pottery Barn and Restoration Hardware are my weaknesses! But I have a hard time really decorating my house when I know we are going to move in less than a year. I know I should, just to make it more homey, but I struggle with that. So I have about 10 boxes in the basement what could have a multitude of decor, but I refuse to go through them. haha! I need your help! Yes, to all of this. Gorgeous. I am in a constant state of decorating and rearranging everything. It drives Scott crazy. Dude. 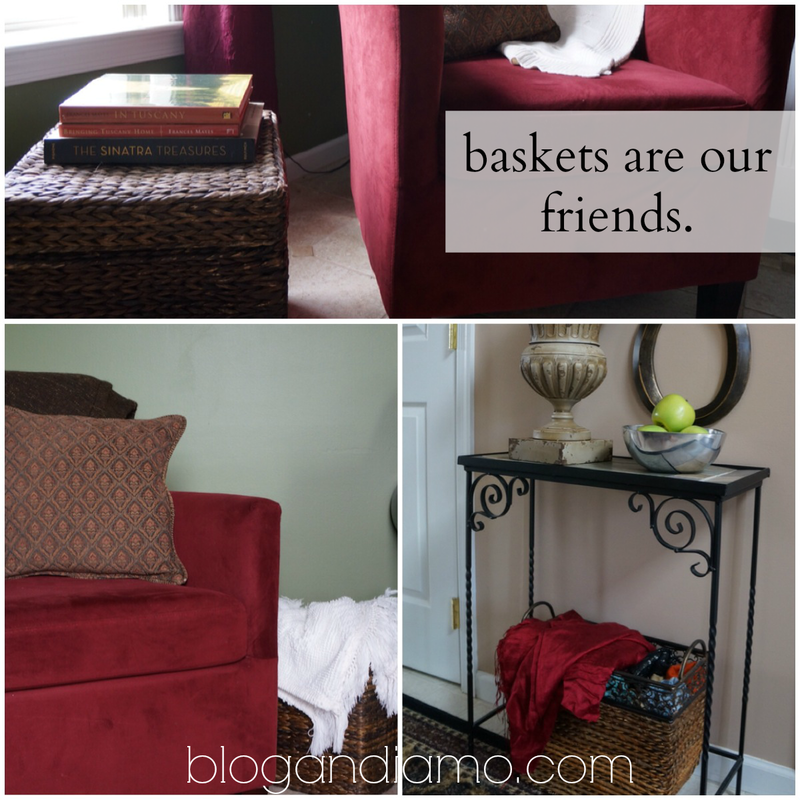 Baskets are our friends. I want to laugh and also decorate my house. And I have to say, y'all have an amazing looking place! I def felt like it was a Pottery Barnesque house!